Shanghai Disneyland is getting a Toy Story Land expansion on April 26, 2018, with a new Woody’s Round-Up ride as its centerpiece. 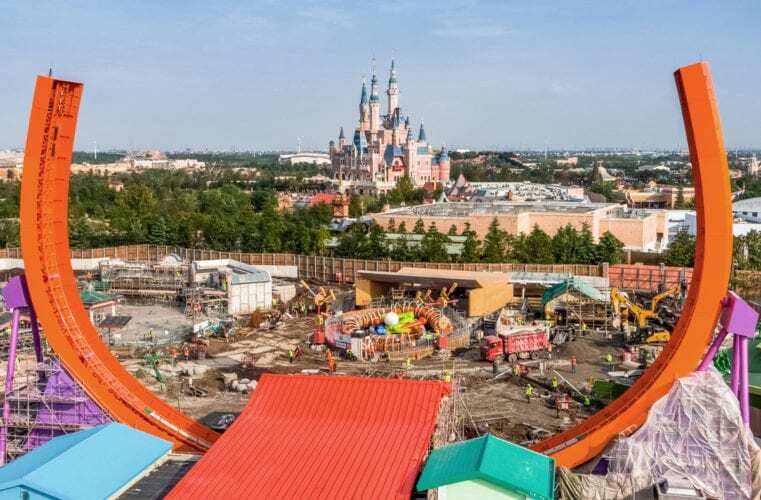 Shanghai Disney Resort has announced that major construction is nearly complete and testing is underway on the new attractions that will be featured in Shanghai Disneyland’s Toy Story Land, which will officially open on April 26, 2018. Toy Story Lands can already be found at Hong Kong Disneyland and Walt Disney Studios Paris, and one is currently under construction at Disney’s Hollywood Studios in Florida. 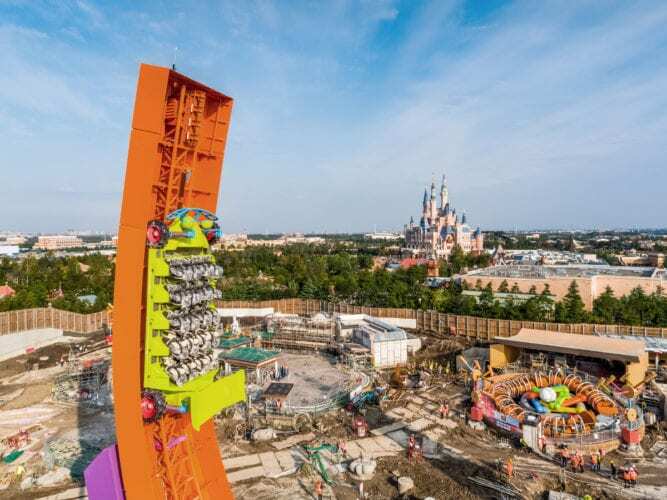 Now, Shanghai Disney Resort has officially set an April 26, 2018 opening date for yet another Toy Story Land, which they broke ground on last year at the newest Disney theme park. Toy Story Land will be the seventh themed land at Shanghai Disneyland, once this first post-opening expansion of the park debuts next year. 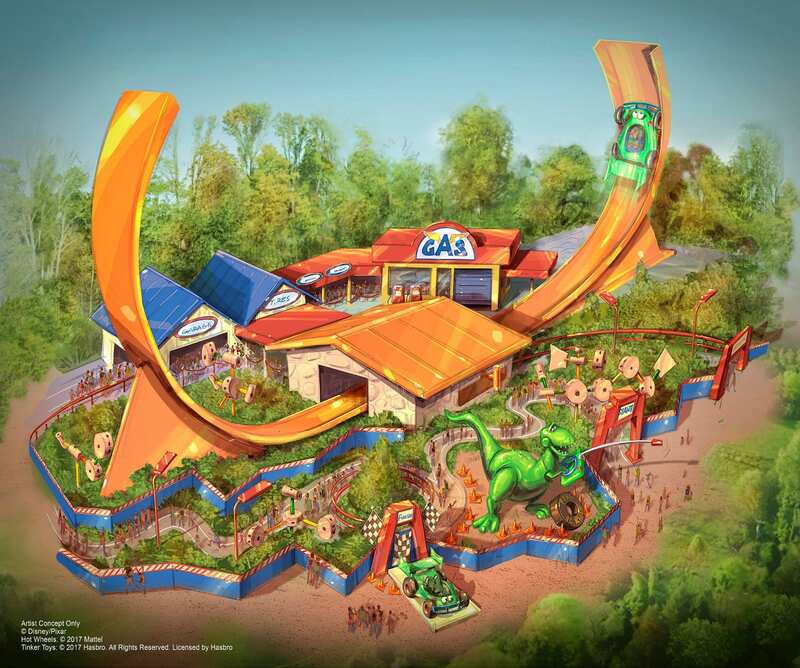 The new land will feature attractions for guests of all ages, many of which have previously debuted elsewhere around the globe. 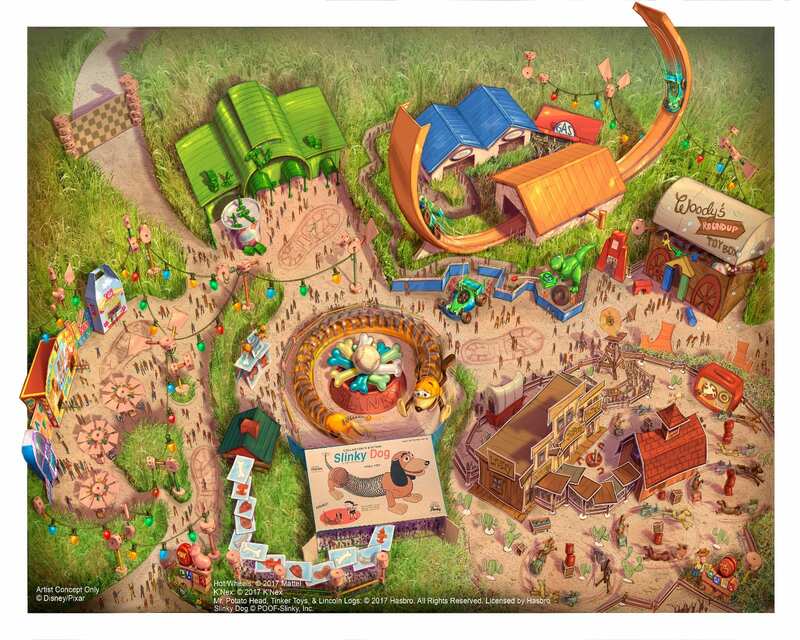 Based on the Disney/Pixar motion picture series, Toy Story Land will be a” high-spirited, colorful world” where guests will feel as if they’ve been shrunk down to the size of their favorite Toy Story toys in the backyard of Andy, the boy from the movies. Sheriff Woody has rounded up a herd of ponies, each one pulling a cart, in a ranch set up by Andy. Guests can climb aboard the carts as the ponies start a little square dance swinging their carts to and fro in time to the lively music. 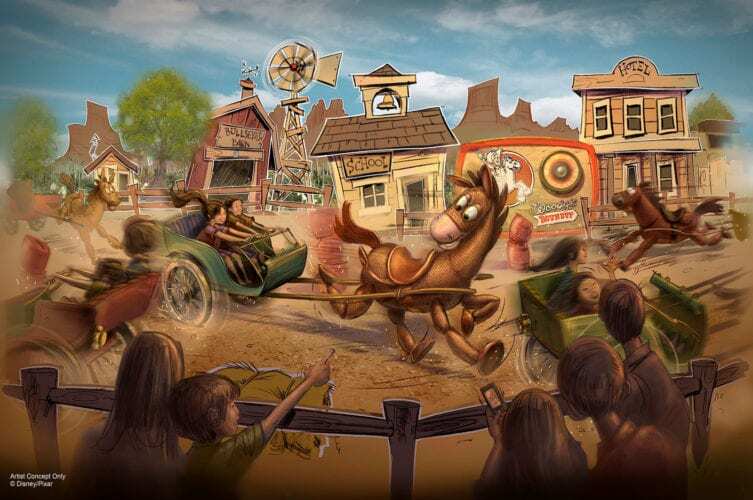 This new attraction apparently uses the same ride system as Mater’s Junkyard Jamboree at Disney California Adventure, but with different theming. Guests will be able to take a seat inside Slinky Dog’s springy spirals and race around a wavy roundabout. 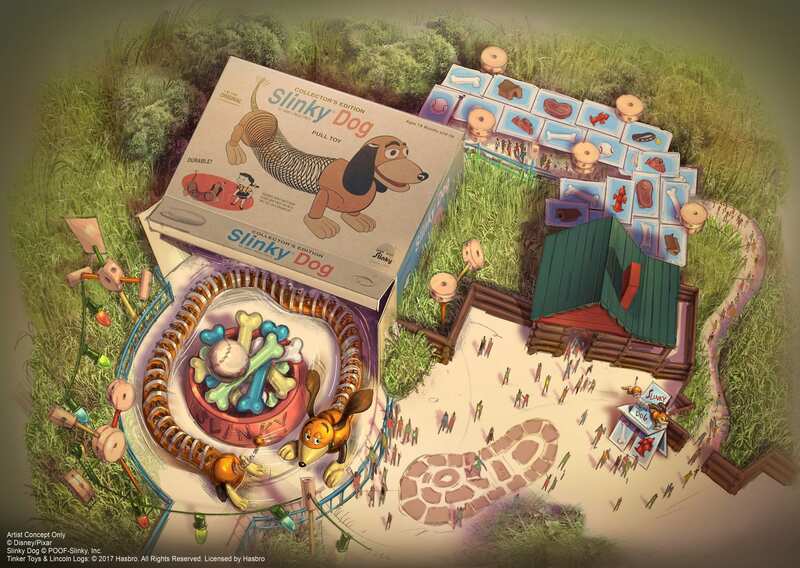 This appears to be a close of the Slinky Dog flat rides found in Hong Kong and Paris, not the new roller coaster being built at DHS. Andy’s insecure Tyrannosaurus Rex toy Rex will invite guests to climb into the RC Racer as it zips forward and backward at ever increasing heights and speed on the U-shaped track. This is also a copy of the RC Racer attractions found in Paris and Hong Kong. Next to Woody’s Round-Up is Old West, a town made up of a hitching post andfaçades for various enterprises, such as the sheriff’s office, the saloon and the bank. Here, guests can meet and pose for photos with Toy Story characters, including Woody, Jessie and Bullseye. Shopping and dining opportunities in Shanghai Disneyland Toy Story Land will include Al’s Toy Barn, the merchandise shop where some of Andy’s toys were purchased in the movie, and Toy Box Café, a restaurant themed to Andy’s packing boxes for Buzz Lightyear, Mr. and Mrs. Potato Head and Lotso Hugging Bear. Shanghai Disney Resort also has the only Toy Story-themed hotel in the world, as well as the Buzz Lightyear Planet Rescue attraction, a guest favorite which features the most advanced Buzz Lightyear targeting system at any Disney park in the world.